MM: Please speak to your background, education, family life and whatever you want the public to know about you. Paul Nylander: Hi, my name is Paul Nylander. My education is in mechanical engineering and physics. My engineering experiences have been somewhat random ranging from plutonium detectors to Disneyland rides. Now I am working on surgical devices, which I must say is the best job I’ve ever had. I have also worked as a C++ and C# software developer. On my spare time, I enjoy math, science, and art. MM: How did you learn about fractals? Paul Nylander: The first time I saw a picture of the Mandelbrot set fractal was at a bookstore in 1998. I was fascinated by it and I wanted to learn how to create it, but I couldn’t understand the math. So I went around my college math department asking professors for help, but many of them didn’t even know what a fractal was. It wasn’t until 2001 that I finally found a website that explained it in a way I could understand. I stayed up late and finally created my first complex fractal, but it was distorted and looked like cobwebs. I felt that I had discovered something great. I excitedly showed it to other people, but they didn’t seem very interested. But I continued learning new fractals and adding them to my website. MM: You had the opportunity to engage with many of the pioneers during the early development of 3D fractals. Do you still communicate with any of them? Paul Nylander: Not very often, but I do have much respect for them. I feel Daniel White deserves the most recognition for coming up with the best 3D Mandelbrot formula and advancing everyone’s appreciation of 3D fractals. Thomas Ludwig also played a critical role in creating the first high-quality rendering. Rudy Rucker beat everyone to the punch with his similar formula in 1990, but it didn’t attract much interest at the time because he did not have a high-quality rendering of his beast. I can only imagine what might have happened if Rudy had access to the same rendering capabilities back in 1990. MM: What went through your mind when you first rendered the 8th order Mandelbulb set based on following the generalized variation of Daniel White’s original squaring formula? How long had you been working toward that discovery before it happened? Paul Nylander: I had been working on 3D Mandelbrots for about 2 months before I rendered higher power Mandelbulbs. I thought they were pretty neat, but I didn’t think they were a breakthrough. Everyone’s goal was to find a 3D formula that that could produce all the wild variety and extravagantly ornate details of the 2D Mandelbrot Set. The problem with the standard quadratic Mandelbulb is that it has some distorted regions that look like stretched out taffy. The higher order Mandelbulbs certainly are an improvement, but they also have regions that look stretched out. MM: You mention the “Persistence of Vision Raytracer” (POV Raytracer) multiple times on your website. How critical was this software to the development of the first 3D Fractal images? Paul Nylander: Not at all. C++ was my tool of choice. It wasn’t until later that I learned how to render hypercomplex fractals on POV-Ray, although I must say it is a very slow way to render. However, I do think POV-Ray is a convenient tool for visualizing other types of mathematical beauties. MM: I know you are a Mechanical Engineer. Rapidly changing technology has introduced many new industries requiring the expansion of the scope of design tools available to Mechanical Engineers, designers, and drafters. Considering advances in robotics, rendering, 3D design and printing, texturing and 3D modeling: How have technological advances affected CAD/CAM software and the ongoing skills required for Mechanical Engineers today? Paul Nylander: There is much I can say about this, but I can only speak from my own personal experience, so my advice may not be applicable to everyone. I learned a great deal during my most recent job transition. Some people say the half-life of an engineering degree is 5 years, others say 2 years. I can say from my own personal experience that I have used very little of what I learned in college throughout my career. The key is to learn how to learn. If you are becoming bored at your job, then that is a sign that you have probably stopped learning and it’s time to move on to a different job. If you are afraid to take the risk of changing jobs, you may be putting yourself at even greater risk because your marketability as an engineer will plummet. If you find an employer that truly cares about developing your skills, then you have much to be thankful for. Unfortunately, most companies do not care whether you have many diverse skills; they are only interested in candidates who have the specific experience they are looking for. Good mechanical engineers should also be machinists. There’s nothing more frustrating to machinists than engineers who design parts that are impractical to produce. Join a local maker space and learn how to use the CNC mill. Build something amazing. Bringing show-and-tell items that you designed and built yourself is a great way to impress prospective employers during a job interview. Also, if you have ever spent much money on your own projects, then you quickly learn to appreciate the value of a dollar, and you are less likely to be wasteful of your employer’s money. Robotics is one of the best things an engineer can have on their resume. If you don’t know robotics, I highly recommend buying some kits or participating in robotics clubs. One of the best career decisions I ever made was to buy my own license of SolidWorks many years ago. I might have become obsolete if not for that. Don’t be afraid to suggest unconventional ideas and disagree with everyone else. It’s better to be laughed at than to always be silent during business meetings. The best engineers I know have lots of bad ideas, but they also have lots of good ideas. The important thing is that they have lots of ideas in general. And the only way you’re going to have lots of ideas is if you know about lots of things. That being said, I should note that the best engineers are not necessarily the highest paid engineers, based on what I’ve seen. Self-employment is another option, but cash flow can be sporadic (“feast or famine”, as they say). If you really want to be self-employed, I recommend Michael Gerber’s book “The E-Myth Revisited – Why Most Small Businesses Don’t Work and What to Do About It”. It is not enough to be a great technician, you must also be a manager and entrepreneur if you want to succeed on your own. Too many times, highly skilled people start their own businesses thinking they got what it takes, only to become burned out when the work piles up, or when they micromanage their employees. MM: You told me in an email that you have moved somewhat out of “my fractal phase”. What are you currently doing? Paul Nylander: Yeah, I got burned out rendering fractals when I saw that it was taking too much of my time and it wasn’t paying my bills. So what am I doing these days? Well, besides work and family life, I have been trying to develop my own product lines of lamps and toys. I am currently selling a few expensive products to people who are willing to pay for them, but my long-term goal is to create affordable products for everyone. I have had some fun with 3D printing but I am especially interested in plastic injection molding, as it is still the most economical means of mass production. I recently joined a local maker space where I learned how to do CNC milling, plastic injection molding, laser cutting, vacuum forming, welding, etc. I have also been getting more into electronics, designing custom circuit boards with Arduino’s, LED’s, stepper motors, etc. One of my bigger side projects has been building a pick-and-place machine for assembling surface mount components on circuit boards. I have also been reading lots of books lately, about topics like consciousness, causality, evolution, and religion. These things are interesting to think about, but also very serious to me. There are many things that I take on faith (everyone does), but I insist that faith must be reasonable. I feel it is important to be well educated on different views and encourage open discussions with other people. MM: What is your impression of the fractal images, animated videos, virtual reality and even movies today? 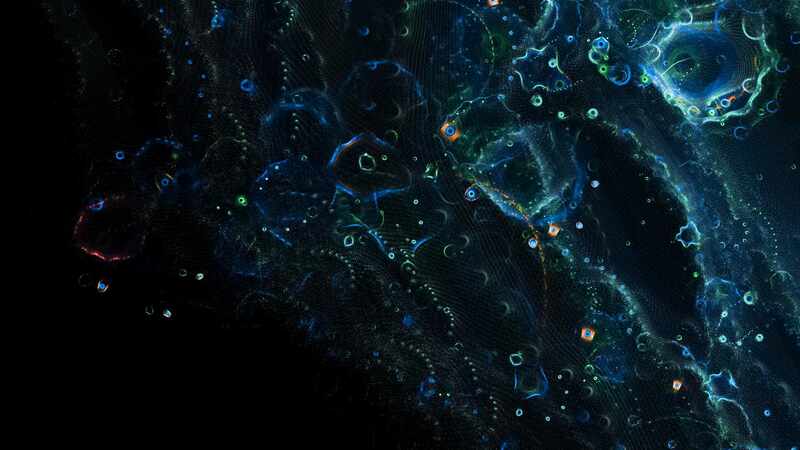 Movie executives from Guardians of the Galaxy 2 commissioned digital and fractal artist, Hal Tenny to provide images used to conceptualize some of the fractal work produced in the film. Others have developed ways to inject fractals into their latest projects. Are you following the progress and growth of fractal sciences as they become more mainstream? Paul Nylander: I have not been following it. Thanks for the heads up. I was quite excited when I saw the Mandelbulb in Big Hero 6, and also in the Annihilation trailer. Nobody told me about these cameo appearances; I just accidentally discovered them on my own, so I can only presume that the Mandelbulb and related fractals have continued to grow increasingly popular. If there are other major appearances of the Mandelbulb, I would be interested to know about it. MM: Do you have any fractal art hanging in your home and if so, who created it? What advice do you have for those who are developing software and tools, studying and producing fractal works in this rapidly expanding time in history? 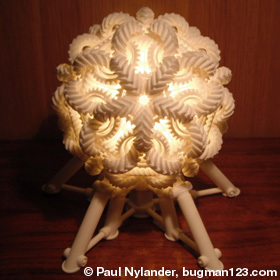 Paul Nylander: I have no fractal art in my home. I do have a cast bronze loxodrome sconce on my wall, although technically that’s not a fractal. My advice to those who want to create fractal art is to concentrate more effort on 3D Kleinian quasi Fuchsian Limit Sets. I think the most jaw-dropping sights remain hidden in there. But this is just my personal opinion. After all, beauty is in the eye of the beholder. Honestly, I am a little surprised that people have taken more interest in the Mandelbulb than 3D quasi Fuchsians. I guess it is because they are so mathematically difficult to render. I understand Jos Leys developed an efficient algorithm to render them in 2016. This interview inspired me to take another look at quasi Fuchsian. I have some ideas that I would like try, so perhaps if time permits I will give it another shot. MM: Paul has been so gracious throughout the process of this interview. I owe him a debt of gratitude for his willingness to participate allowing me to step into his world and pick his brain!